The Scholarly Communication department and the IUScholarWorks staff are pleased to announce that our new, completely redesigned website is live and available to the public. The URL hasn’t changed (scholarworks.iu.edu), but we’ve added new convenient ways to contact us, submit material to IUScholarWorks, and find answers about our services. We are also pleased to welcome Nicholas Homenda to the department. Nick, who is Digital Initiatives Librarian in the Digital Collections Services Department, will also serve as Interim Scholarly Communications Librarian. Nick is a welcome and familiar contributor to scholarly communication initiatives in the Libraries. Shayna Pekala, who contributed to some of our most successful digital initiatives as a student and Visiting Scholarly Communication Librarian over the past several years, is heading to Washington, DC to become the Discovery Librarian at Georgetown University. Shayna was largely responsible for the planning and implementation of our new website, which went live during her very last week with us. Spring 2016 Copyright & Publishing Workshops Are Here! We are thrilled to announce our lineup of Copyright & Publishing workshops for Spring 2016. 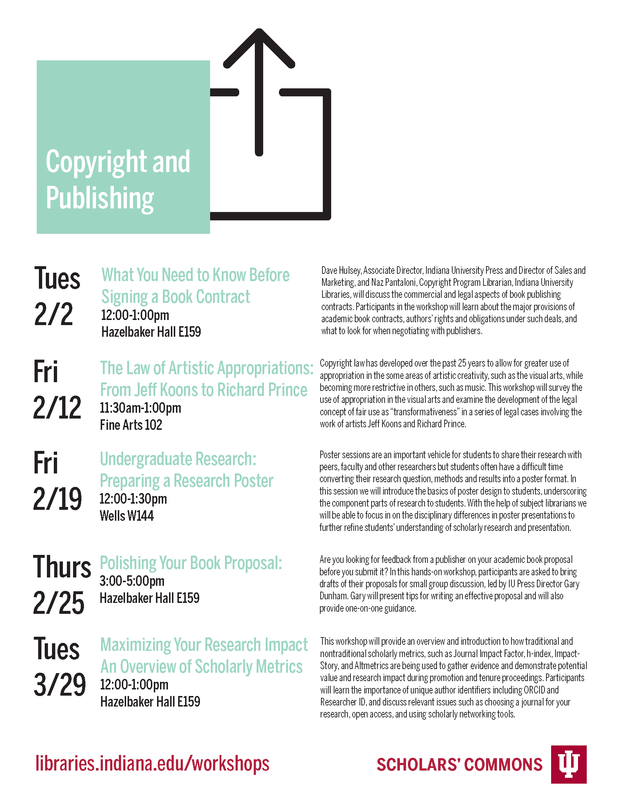 Join the Scholarly Communication team and our colleagues in the Libraries, the IU Press, and the Office of the Vice Provost for Undergraduate Education to learn about copyright for visual artists, creating a research poster, scholarly metrics, and more! The Office of Scholarly Publishing will be hosting a series of Academic Publishing workshops this fall semester. Topics of discussion will include how to navigate the world of academic publishing, book proposal writing, journal publishing agreements, and preparing a scholarly journal. Faculty and students planning to publish their research are encouraged to attend! 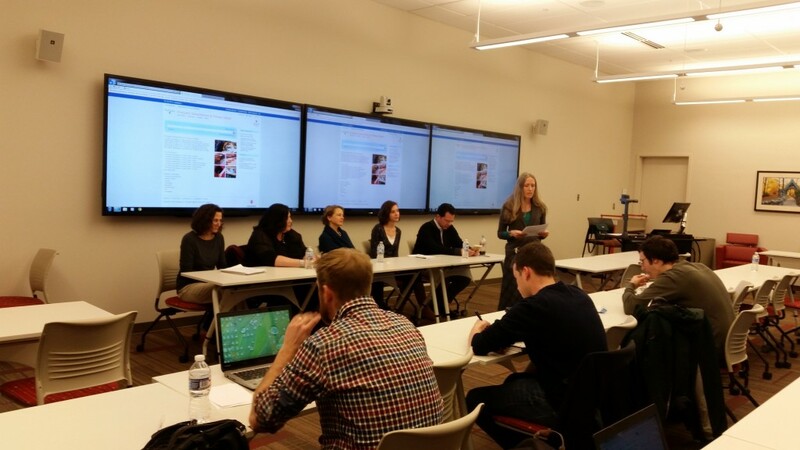 Workshop recap: Should I embargo my dissertation? Last week, The IU Scholars’ Commons sponsored a workshop on the hotly contested topic of whether or not soon-to-be PhD’s should embargo their dissertations. Attendees learned the many ways that this seemingly minor decision may have significant implications for their academic careers. The workshop brought together panelists representing a variety of stakeholder groups to share their viewpoints, which are summarized below. At Indiana University, graduate students are required to submit their dissertations to ProQuest, a commercial database provider, where they have a choice of two publishing options: Traditional or Open Access. With the Traditional Publishing option, only those with access to ProQuest through a library subscription or who purchase an individual copy of the dissertation will be able to view the full text. With the Open Access Publishing option, anyone with an internet connection will be able to read the entire dissertation. To avoid the $95 fee for Open Access Publishing in ProQuest, students can submit their dissertations to IUScholarWorks, a free service provided by the IU Libraries. * In addition to choosing between Traditional and Open Access Publishing, students may also select an embargo length of up to two years (or more, with special permission from the Graduate School). Placing an embargo on a dissertation means that no one in the world will be able to able to view its contents for the specified length of time. So, to embargo or not to embargo? *Submitting to IUScholarWorks alone does not fulfill the requirements for graduation; the dissertation must also be submitted to ProQuest. Students who wish to make their dissertation Open Access are advised to select the Traditional Publishing option in ProQuest and then submit to IUScholarWorks. Learn how at https://scholarworks.iu.edu/deposit. Your dissertation contains patentable intellectual property for which you have not yet received a certificate. While you automatically own the copyright to your dissertation upon its creation, copyright only protects the fixed expression of your work as a whole, NOT any of the ideas or facts presented within it. Your dissertation contains sensitive data. Your dissertation contains work that is still in copyright that belongs to a third-party who has not given permission to redistribute it and your use in the dissertation is not a fair use. A publisher is interested in turning your dissertation into a book and has expressly told you they will not do so if the dissertation is available online. Read more about future publication concerns. The more accessible your dissertation is, the more likely it is to be cited. Making your dissertation accessible allows it to be scrutinized by others in the field, promoting collegiality. You don’t want to be plagiarized. If you’re worried about copyright infringement and/or plagiarism, then you should get your idea out there as soon as possible so that it’s publicly documented and accessible. That way, you have proof that the idea originated from you and that the alleged infringer had access to your work. While copyright protection is automatic, people who are concerned about copyright infringement can also register a copyright in it with the U.S. Copyright Office. ProQuest will do this for you for an additional fee of $55, or you can do it yourself for $35 at http://copyright.gov/eco/. Registration provides statutory damages and attorneys’ fees in the event of infringement. Having dissertations available helps teach future scholars about the process of scholarship. You do not intend to pursue a tenure-track position. Many students and their advisors have unfounded fears that publishers will not publish a book that is based on a dissertation, yet there are no facts to support this. When a dissertation goes through the publication process, at least 50% of the information changes in some shape or form. Dee Mortensen, Senior Sponsoring Editor at the IU Press, compares the relationship between a dissertation and a book to that of a chrysalis and a butterfly. Furthermore, Ellen McKay, Associate Professor of English, relates that faculty are now expected to be able to statistically describe the difference between their dissertation and book, and less than a 50% difference is considered an insufficiently edited work. Because of the substantial alteration involved in the transformation of book to dissertation, there is no commercial disadvantage in having the original dissertation available. The study “Do Open Access Electronic Theses and Dissertations Diminish Publishing Opportunities in the Social Sciences and Humanities?” supports this claim, finding that most publishers (93% of university presses) do not consider an ETD a prior publication that would completely disqualify the revised version from publication. Deciding whether or not to embargo your dissertation is an extremely personal decision that should not be taken lightly. In the end, the question really comes down to what you want to do with your dissertation. Many of the reasons to embargo assume that the author intends to turn it into a book to fulfill the requirements of tenure and promotion. If this is not your intention, then by all means free your dissertation and let it be unembargoed. The topic of dissertation embargoes also brings into question whether the current system of tenure and promotion should place so much value on the book, when new technologies afford alternative possibilities that permit broader and more efficient knowledge dissemination. A big thank you to all of the panelists: Judith Allen (Professor, Department of History), Ellen McKay (Associate Professor and Director of Graduate Studies, Department of English), Dee Mortensen (Senior Sponsoring Editor, IU Press) Nazareth Pantaloni (Copyright Librarian, IU Libraries), and Shayna Pekala (Open Access Publishing Manager, IU Libraries). Thank you also to Shelly-Gerber Sparks and Celestina Savonius-Wroth for their contributions to the event. Interested in using data visualization to enhance your research but don’t know where to begin? Learn how to use basic data visualization techniques and tools including Voyant, OpenRefine, Gephi, and Sci2 at our workshop, where we’ll give users the chance to test their skills using data from a variety of open data sources. Experts will also cover the best ways to manage your data throughout its lifecycle. No data visualization experience needed, but attendees should have a working knowledge of Microsoft Excel. This workshop is part of Open Access Week 2013.